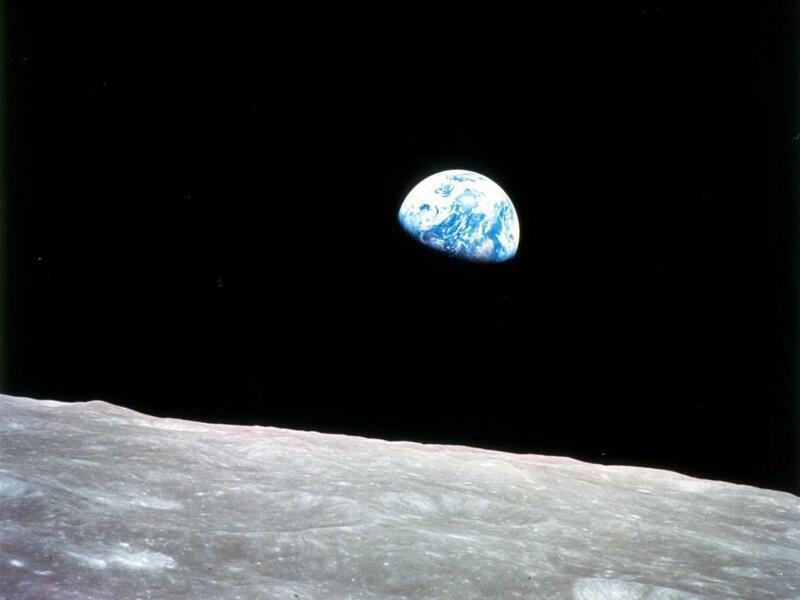 On Anniversary Of Apollo 8, How The 'Earthrise' Photo Was Made : The Two-Way The iconic photo taken on Christmas Eve 1968 "came about by accident," says space writer and historian Andrew Chaikin. A new NASA animation shows just how close the astronauts came to missing the shot. The iconic "Earthrise" photo taken by astronaut Bill Anders through a window on the Apollo 8 command module on Dec. 24, 1968. The first humans to catch a glimpse of the Earth rising over the moon nearly missed seeing it at all, let alone capturing the snapshot that became one of the most iconic photos of the 20th century. NASA has released an animation commemorating the 45th anniversary of Apollo 8, the first manned mission to orbit the moon. The famous "Earthrise" photo was taken on Christmas Eve 1968. "It really came about by accident," space author Andrew Chaikin, who narrates the video, tells NPR's Morning Edition in an interview that will air Tuesday. Comparing new data from the Lunar Reconnaissance Orbiter probe, which has been circling the moon since 2009, with the Apollo 8 astronauts' photography and Apollo 8's onboard audio, the Goddard Space Flight Center's Scientific Visualization Studio has been able to discover just how serendipitous the famous snapshot was. "It turns out that the only reason the astronauts saw the Earth when they did was because Frank Borman, the mission commander, was in the process of rotating the spacecraft — which was pointing nose down at the moon," Chaikin tells NPR. "It just so happens that as they came around, Bill Anders, the rookie on the flight over on the right side of the spaceflight, could see the Earth coming up in his window. This had happened three previous times on Apollo 8, but they weren't in position to see it," he says. Aboard Apollo, Anders is the first to see the potential shot: "Oh, my God, look at that picture over there," he can be heard saying. "There's the Earth coming up. Wow, is that pretty!" Anders (to astronaut Jim Lovell): "You got a color film, Jim? Hand me a roll of color, quick, would you?" Lovell: "Oh, man, that's great! Where is it?" Anders: "Just grab me a color. A color exterior. Hurry up. Got one?" Lovell: "Yeah, I'm lookin' for one. C368." Lovell hands him the film just as Anders is heard saying, "I think we missed it." But within seconds, Lovell sees the shot again in another window of the command module. He asks for the camera from Anders, who seems a bit defensive at having his role as mission photographer usurped. Anders: "Wait a minute, just let me get the right setting here now, just calm down. Calm down, Lovell!" Anders then gets the shot that has been reproduced thousands of times all over the world in the past 45 years. "It sounds incredible to us to think, 'Weren't they looking for [the Earth] when they got to the moon?' " Chaikin tells NPR. "But as Bill Anders explained to me many years later, he said, 'Look, we were trained to go to the moon. We were focused on the moon, observing the moon, studying the moon, and the Earth was not really in our thoughts until it popped up above that horizon." Meanwhile, on Monday, Lovell re-enacted another memorable moment from the groundbreaking mission: a Christmas Eve broadcast from lunar orbit. Lovell, Borman and Anders took turns reading from the Book of Genesis. "From the crew of Apollo 8, we close with good night, good luck, a Merry Christmas and God bless all of you, all of you on the good Earth." Correction at 10:35 a.m. ET, Dec. 24: We initially wrote that Anders saw the moon coming up in his window. But as commenter "leew261" noted, it was the Earth that Anders saw rising. We've corrected the wording above.